Foundation chains are the start of all crochet patterns worked in rows. There are alternatives to the foundation chain which I’ll be covering in the future but this guide will help show you how to crochet foundation chains and get your crochet work off to a stable start. 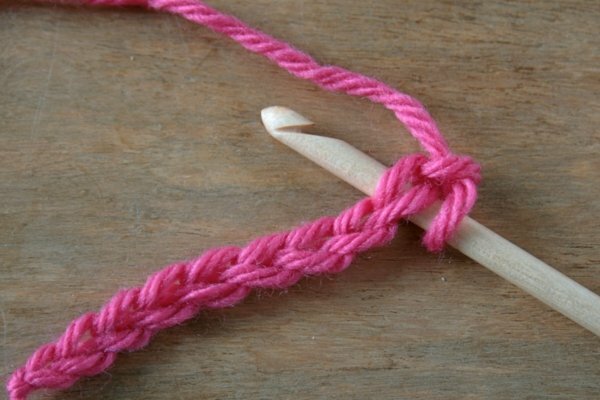 We’ll begin by looking at how to make a chain stitch. Start with a slip knot on your hook. 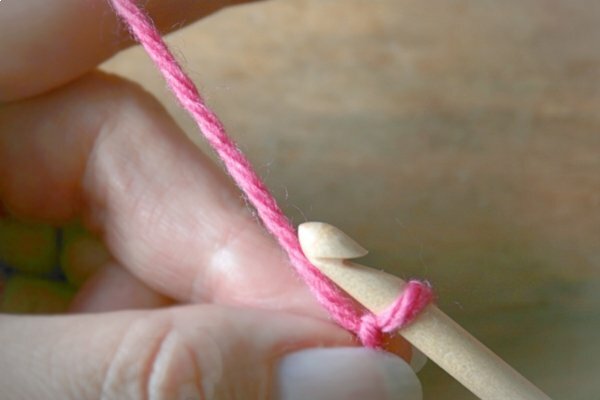 Hold the yarn tail and the base of the slip knot with your left hand thumb and middle finger. Use your right hand thumb and middle finger if you are left-handed. Pass the hook under the yarn and then bring the hook forward over the yarn. 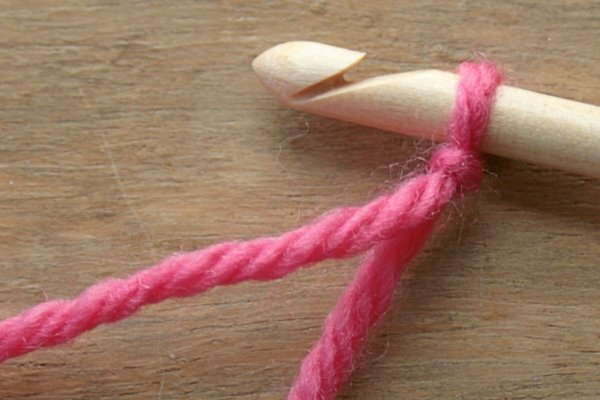 Catching your yarn with the hook is called a yarn over. In my patterns I abbreviate yarn over to yo. In other patterns you’ll see it abbreviated as yoh (yarn over hook) and yrh (yarn round hook). 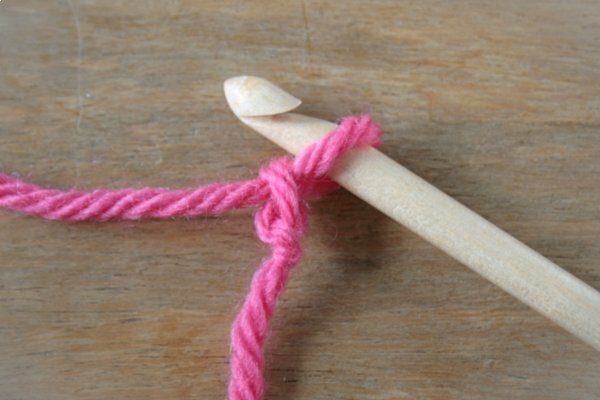 Now pull the hook and yarn through the slip loop on your hook. It should look like this. YAY! 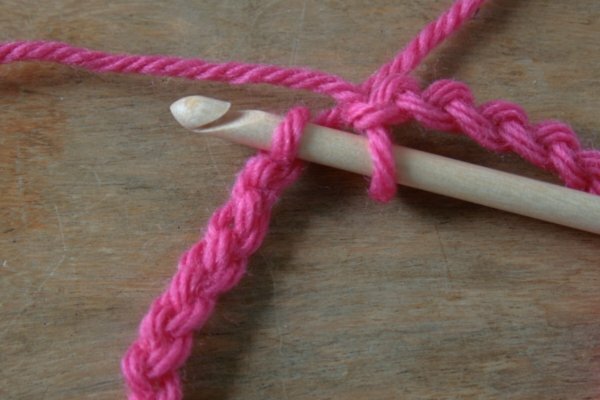 You’ve made a chain stitch! Follow the steps in the last three photos again to make a row of chain stitches. 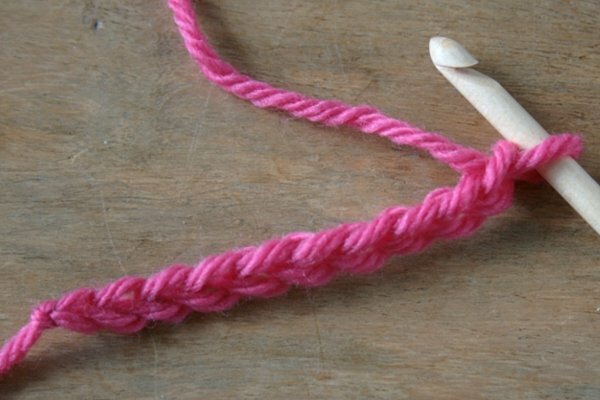 As you work, keep moving your thumb and middle finger up the chain and hold the yarn right below your hook. Soon enough you’ll have a string of chain stitches that look something like this! Try to make your chains the same size. 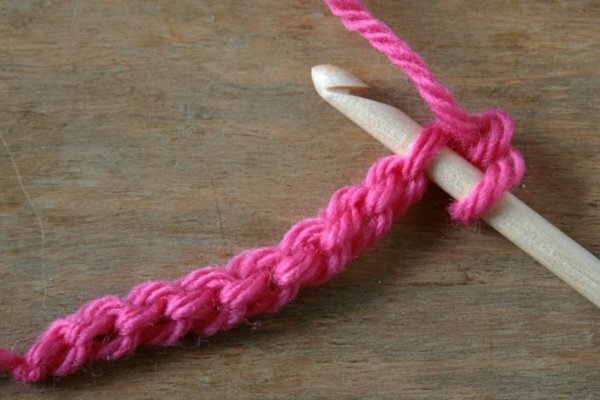 Each chain stitch should be no bigger or smaller than the shank of your hook. They shouldn’t be too loose unless the pattern you are using tells you to loosely chain stitches. If you make the stitches too tight it will be difficult to work into them later on. 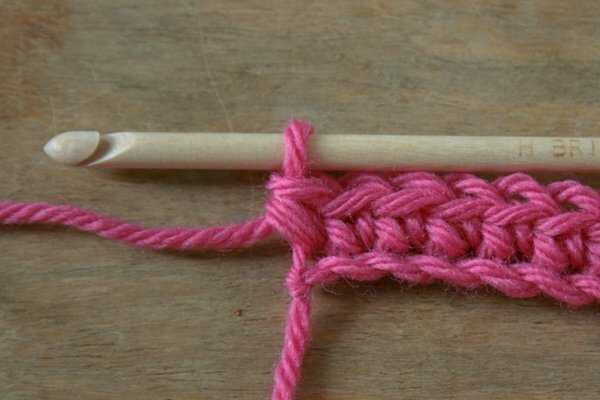 Lots of people make tight chain stitches, especially when you are new to crochet, so it’s good to remember that you don’t have to use the same sized crochet hook as the rest of the pattern. I tend to use a larger hook for the foundation row, either one or two sizes bigger, so I know my chain stitches will be loose enough to work into. On a piece of crochet worked in rows, tight chain stitches can pull the finished piece in too tightly which is very disheartening! Be aware that using a much larger hook than the pattern calls for will result in a loose, and somewhat saggy and unsighlty, foundation chain. Crochet patterns begin by telling you how many chains to make. 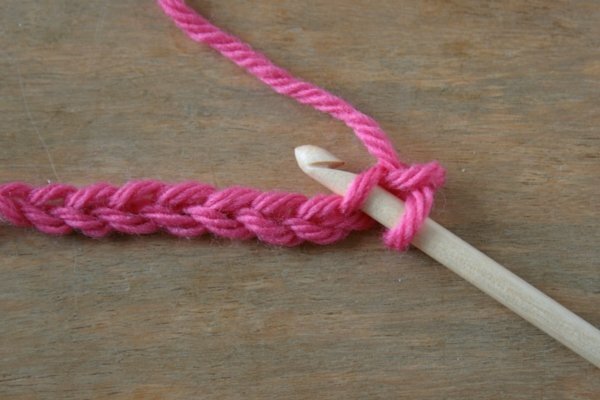 It’s important to understand how to count the number of chains you’re making and very easy to get in a muddle if you are new to crochet. 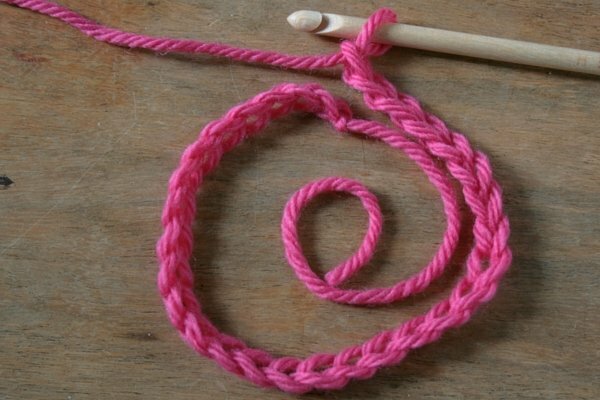 After working your first chain stitch there will still be a loop on your hook. This is not a chain stitch! 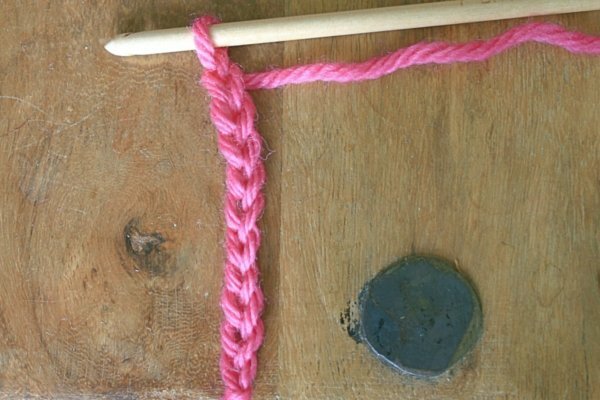 The loop on your hook is the ‘working’ loop and is never counted as a chain stitch. 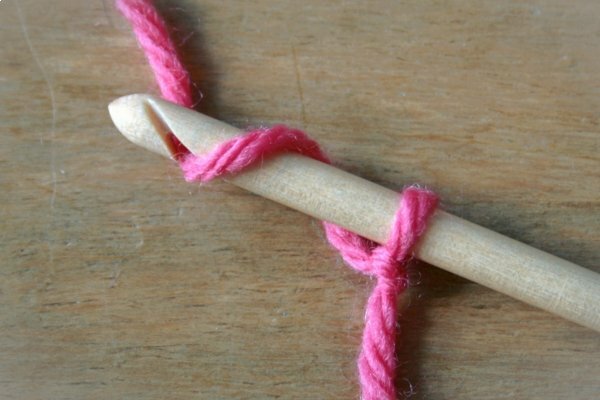 It took me ages to get that straight in my head when I was learning to crochet! It’s also handy to be able spot a chain stitch from front and back. Count your chain stitches from the front as its much easier to see them. The front of the chain stitches looks like a plait of hair. The back of the foundation chain looks like this. Now you’ve worked your foundation chain it’s time to work the first row. We’ll work a row of single crochet stitches. There are three methods to choose from and all of them are suitable for most patterns. There are no wrong and right ways here, any one will do. I have my preference but that doesn’t mean its better than the others – just my preference. Have a go with each of them and see which method you are most comfortable with and gives the best result. 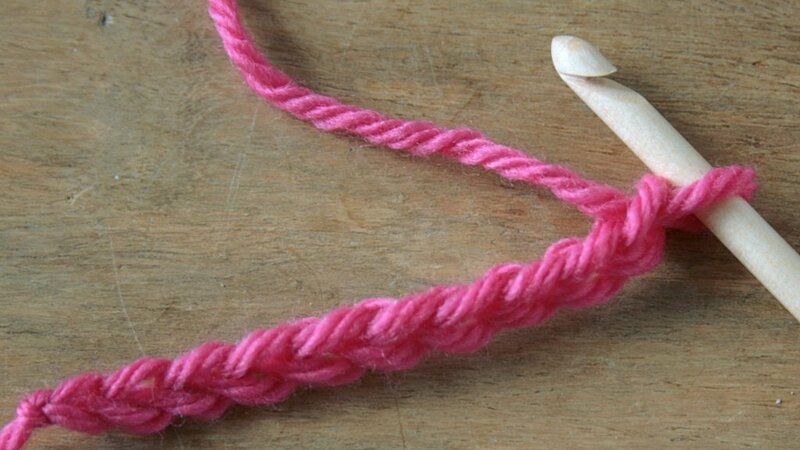 Insert your hook, from front to back, under one loop (see photo) in the second chain stitch from your hook. 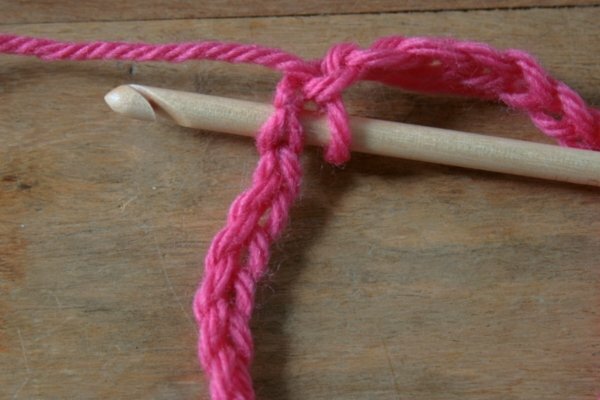 Yarn over and pull a loop through to the front, yarn over and pull the loop through the two loops on your hook. That’s the first single crochet made! Carry on in this way, working into each chain stitch. Notice how the bottom of the row looks. 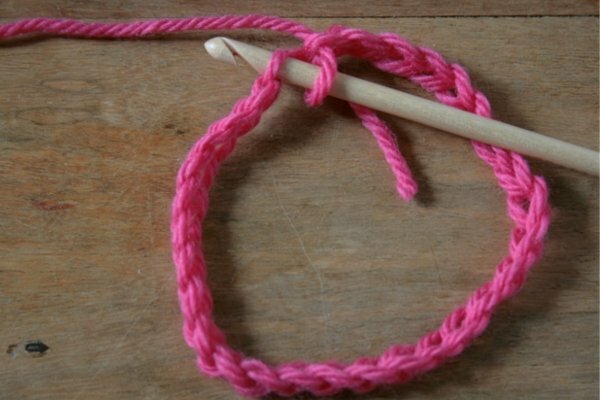 Insert your hook, from front to back, under both loops (see photo) and work a single crochet. Repeat across the foundation chain. Notice how the bottom of the row differs from the first method we used. Some patterns will tell you to turn the foundation chain and work into the back loop (lots of mine do!). This isn’t set in stone and you can use one of the other methods if you prefer. It’s a bit more fiddly to work as you will turn the foundation chain so you can see the bumps at the back of the stitches. Those bumps are what you’ll be working into. Turn the foundation chain so you can see the bumps at the back of each chain stitch. Insert your hook under the bump of the second chain stitch from your hook. 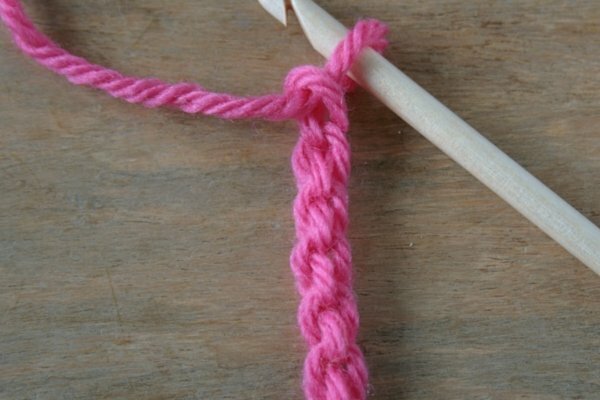 Work your first single crochet. Repeat across the foundation row. This technique is, quite frankly, awesome. When you’ve worked the first row of the pattern you’ll see that the bottom of the row will look just like the tops of stitches. This is really handy when you are making an item that you won’t be adding an edging to. This technique also has the most flexibility and stretch to it so is handy for clothing and accessories. This method is my favourite way to crochet foundation chains! If you are making a tubular item (hats, gloves, cowls, etc), you’ll need to join the foundation chain to form a ring. Make a ring with the foundation chain taking care not to twist the stitches. Insert your hook through one loop of the first chain. 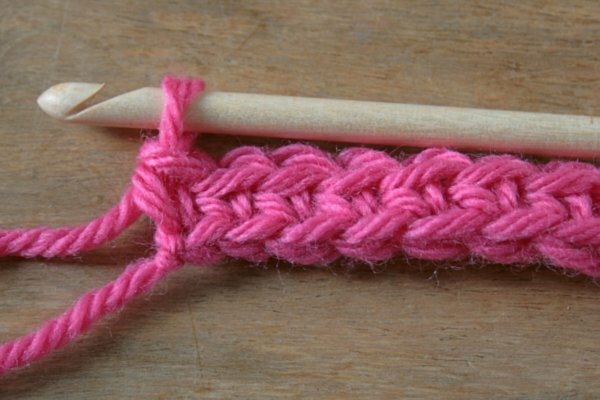 To work a round of single crochet, chain 1 stitch to get up to the right height. 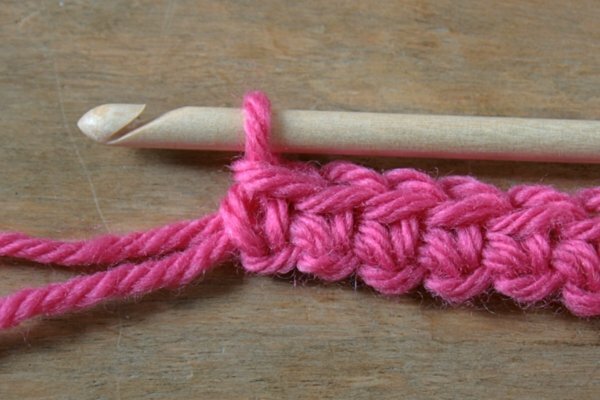 You can use the chain 1 as an actual single crochet stitch, or, you can work a single crochet stitch in the same place and pretend the chain 1 doesn’t exist. It depends on what your pattern instructs you to do or which you think is best. Insert your hook through both loops of the first chain stitch. Insert your hook through the back loop (bump) of the first chain stitch. I hope this How to Crochet Foundation Chains tutorial helps you conquer the humble foundation chain and gets your hooking off to a speedy start.